We are here to help you find high-end countertops you want to add to your Dublin home. At The Granite Guy, we are here to help you find high-end countertops you want to add to your Dublin, Ohio home. We carry a wide selection of high-end options, including marble and quartz. 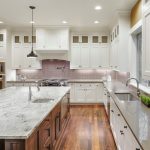 If you prefer granite, check out our exotic options that are more eye-catching and visually appealing for a bold homeowner.